Hey guys how are you doing.? Hope y'all are having great time. Well, I am super duper happy today.. :D , coz I received my sugarbox today.... yayyy :D :D :P. This edition is quite exciting. Sugar box just nailed it this time, with their best goodies and I am so happy with all the goodies that I am literally hopping around with all the cute stuffs I received.. haha :D . Well for all those who are wondering what this sugarbox is, lemme give you a short description about it. Sugar Box is a monthly subscription box full of exclusive goodies which includes fashion, beauty, lifestyle and gourmet products. The best part it that if you pre book it, all the goodies comes as a surprise to you.. :D Great..! isn't it? because who doesn't love surprises. It comes in a beautifully packed white box with ribbon on it. The beautiful packing itself makes you zealous about the products in the box. I was quite skeptical before ordering my first sugar box as I wasn't sure whether I would love it or not. Still I thought of taking a chance and ordered one and to my surprise all the goodies were amazing. When I ordered this edition I was sure it would be out of the world as the name "Fashion forward edition" itself gave a hint. 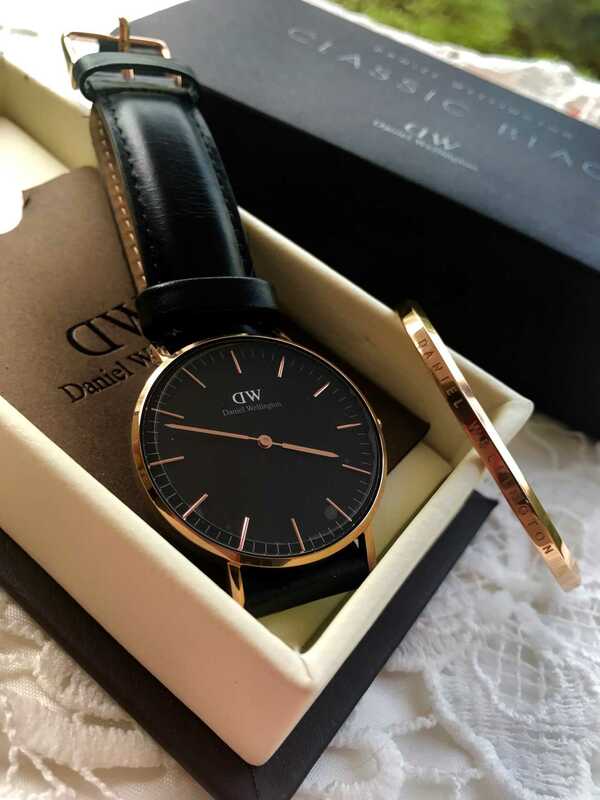 I recieved few cute goodies and I am super excited to tell you what all did I receive. I got a pretty black bare shoulder dress which I absolutely loved a lot. Bare shoulder tops and dresses are trending a lot these days and team sugar box made a amazing choice by selecting a cold shoulder dress for this edition. I also received a super cute white backpack, 3 beautiful lipstick in the shades that I badly wanted, a tumbler, little quirky badges, few candies and a choker which is a must have.. :) . 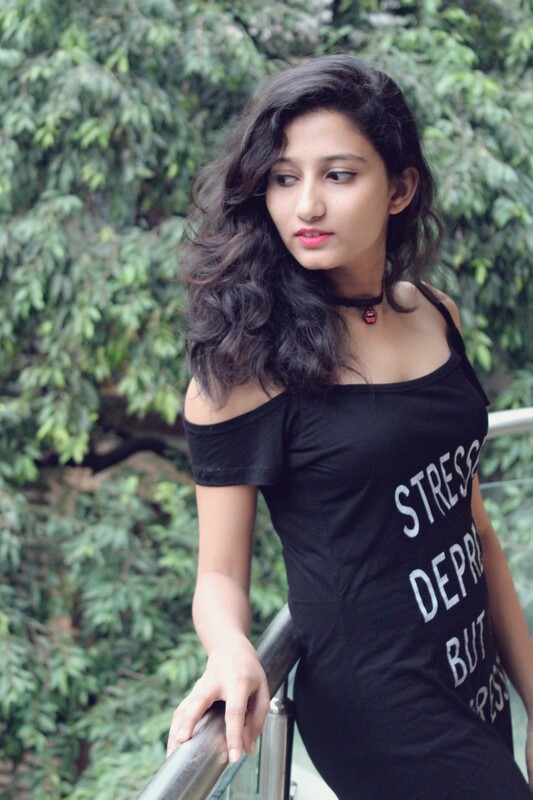 I am so so happy with all these adorable goodies that I straightaway thought of blogging it. I created a look with few goodies which I received in my sugar box. I did not put much effort to create this look as I had everything ready for the look. 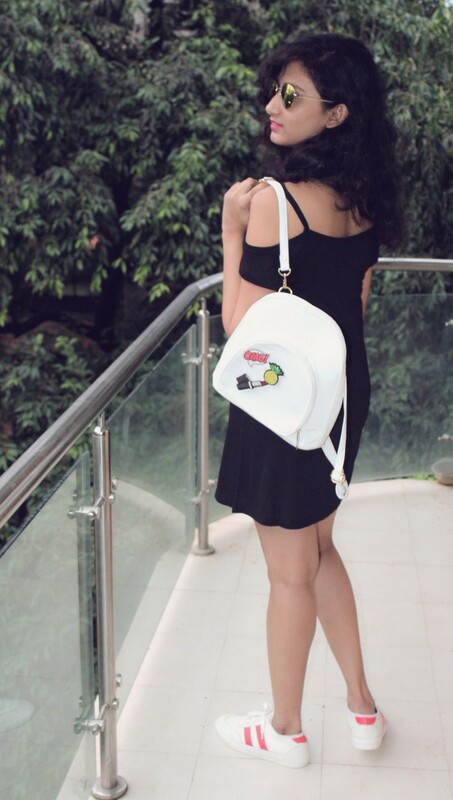 I wore a cold shoulder dress with a black choker pairing it with my white sneakers, annd my favourite white backpack looked awesome with the entire look. 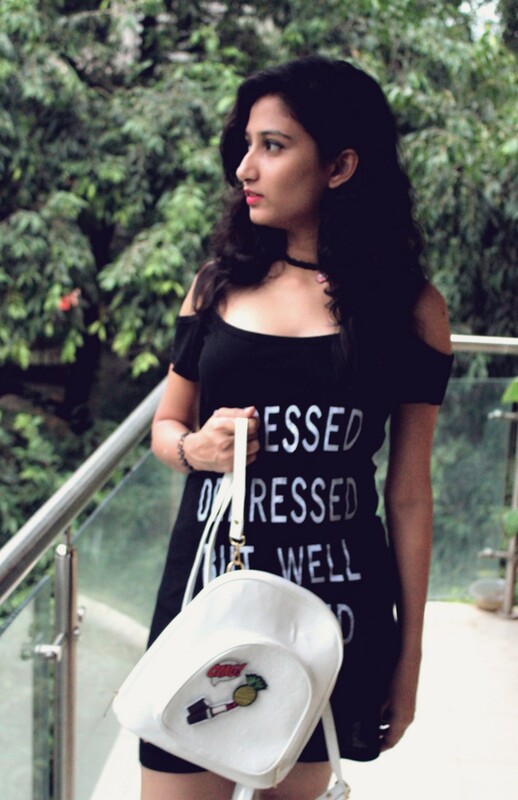 Well, I am not stressed and depressed but definitely well dressed.. :D Hope you'll love this look.<3 Love, Komal Marathe <3 Dress, bag, choker - Sugarbox Sneakers- Street Style Store Sunglasses- Missamore.